3 What Are the Different Kinds of Bananas? 4 Why Do Banana Peels Turn Brown? Bananas have to be cut off the plant while still green to promote the ripening process. 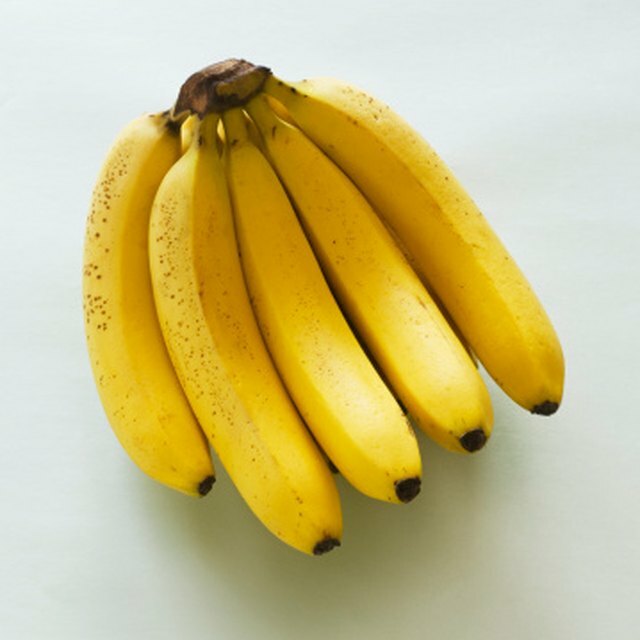 If left on the plant, a banana will split open, and its fruit will change consistency and become dry and cotton-like. When cut from the tree, the banana should still be very firm and very dark green. The bananas are then refrigerated and shipped to wholesalers. Bananas emit ethylene gas, as most food does. This gas accelerates the ripening process. Wholesalers place the bananas for at least four days (and up to eight days) in a room in which air or pressure circulates the ethylene gas around the fruit, promoting even ripening. The relative humidity and temperature must be carefully controlled during this time. If this process is rushed or not properly monitored, it will result in uneven ripening, scarred fruit and an inferior flavor. As the banana ripens properly under carefully monitored moisture and temperature conditions, the skin begins to transform into a lighter green, and may begin turning the fruit's trademark yellow. During this process, the starch in the fruit is being converted to sugar and the fruit is softening, which is what makes the banana sweet and tasty. The banana's readiness is determined on a scale of 1 to 7, with 1 being a dark green, hard fruit, and 7 a soft, yellow fruit with brown flecks or spots. Bananas are ready to be moved to sales shelves when they are at stages 3 (light green) to 5 (half green, half yellow). At this point, at least half the starch has converted to sugar. While partly green bananas are perfectly safe to eat, the banana does not reach its peak of ripeness until it has begun to produce brown freckles and spots. At the browning stage, the majority of the starch has converted to sugar, offering the highest level of sweetness. The best time to consume a banana is, in fact, when most people would consider it to be beginning to rot. Bananas keep best at room temperature in open air. Keeping bananas in a plastic or paper bag will accelerate the ripening stages. You can slow the ripening down by placing bananas in the refrigerator. The fruit will be preserved longer, though the browning of the skin will accelerate.